How To Quickly & Easily Protect Your Affiliate Commissions From Link Choppers, Look 100 Times More Professional, And Instantly Increase Your Affiliate Profits By 500 Or More... Guaranteed!" I bet you're thinking this is a sales letter, aren't you? If you are, you'd be wrong! In case you don't know what affiliate marketing is I'll give you a very simple explanation and show you how you can protect yourself easily and for FREE! Affiliate marketing is a form of online advertising that works by rewarding results. Affiliates can earn huge commissions by promoting other peoples products or services. If you have a website and wish to make money without having to develop products, or build complex technology of your own, affiliate marketing allows you to make money by simply promoting other sites. It is an easy and effective way for you to make money with your web real estate. If you advertise your own products online, affiliate marketing is an efficient way to generate additional income. It's a very cost effective form of advertising for merchants, a way of extending reach to more and more customers. You may not be aware of this problem, but if you promote any affiliate program, it is almost certainly costing you a substantial proportion of your commissions. The problem arises when instead of simply clicking on your affiliate link, a customer copies the link into the Address field at the top of their browser and modifies the link before using it. This modification comes in two forms - chopped links and stolen commissions. For no good reason, other than simply to stop me from getting commission, a surprisingly large number of people will chop off the affiliate part of this link before using it, leaving just https://www.tradebit.com. How To Encrypt Your Affiliate Links For Maximum Profits! Number two: The "Recommends" link looks professional and gives your prospects the impression that you are just recommending a product, therefore, they will not hesitate to look into your recommendation! Conclusion: More people will click on your affiliate links and your chances of making sales will immediately skyrocket! I've done some split testing with my affiliate links and want to reveal the results to you now. Using one of my smaller lists of just over 1000 subscribers I split the list in two even parts then I sent two identical emails to my subscribers. The first half received my email with an un-edited affiliate link. The other half of my list received the exact same email, only this time I used a link that I had encrypted myself and was impossible to bypass. The Result: The first half of the list yielded just 25 clicks making the clickthrough rate around 4. The second half of the list yielded a whopping 149 clicks making the clickthrough rate around 30. I received 5 times more paid sign-ups than the first half of my list. 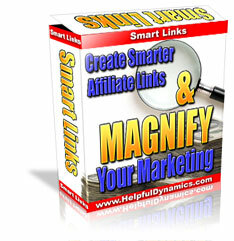 Using The "Recommends" Affiliate Link Can Send Your Online Profits Through The Roof! Guaranteed! Software Programs That Create "Recommends" Affiliate Links Sell For Up To $97.00! Turn Your Affiliate Links That NOBODY Wants To Click On, Into Cash-Generating Magnets That Practically Force Your Prospects To Visit Your Affiliate Page!